Hyundai has taken wraps off the refreshed 2014 Elantra GT, with a more powerful engine, at the 2013 Los Angeles Auto Show. The 2014 Elantra GT is known for its design, five-door functionality, sophisticated suspension tuning and interior space. The look of the 2014 Elantra GT has been sharpened by adding LED taillights. To improve visibility a new integrated driver’s blind spot mirror was also added. Hyundai’s signature hexagonal grille with chrome accents, a chrome beltline molding, sharp projection headlamps, fog lights and available 17-inch alloy wheels with chrome spears complete the modern design. It’s all finished off in the rear with the new available LED taillights. The Elantra GT features seating layouts that can comfortably seat five people. The Elantra GT includes a number of convenient, standard stowage and storage features, including a sunglasses holder, two front and two rear cup holders, door bottle holders, cooled glove compartment, central console storage, sliding armrest, front storage tray and front seatback pockets. 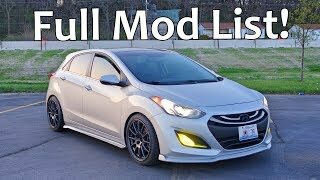 The 2014 Elantra GT is powered by the more powerful 2.0-liter Nu engine delivering 173 horsepower at 6,500 rpm and 154 lb.-ft. of torque at a 4,700 rpm. This powerplant delivers an impressive 24 mpg city/33 highway EPA estimated fuel economy rating with the available six-speed automatic transmission with SHIFTRONIC.